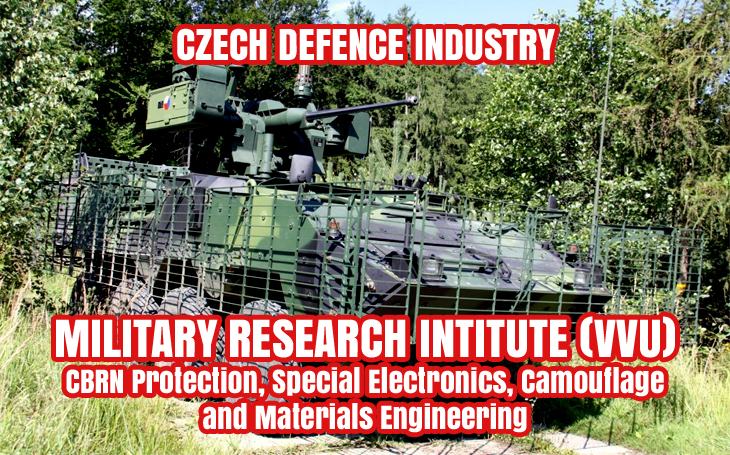 The Military Research Institute was established as a multidisciplinary research organisation in August 2012 in order to support defence and security capabilities of the army, law enforcement and emergency system in the Czech Republic. VVU bases its business on the results of 55-year-long performance of its predecessors which took part in military research and development, such as VTUO Brno (part of the VOP CZ). It holds the Certificate of Facility Security Clearance allowing access up to the level of Secret and NATO SECRET and is active in international trade with military material. VVU performs research and experimental development assignments connected to higher innovations, mainly the technology of ground forces, materiel in the core fields of specialisation that are chemical, biological, radiological and nuclear (CBRN) protection and connected fields, such as chemical protection of the army, sensors, electronic and cybernetic warfare, camouflage and deception, special metal and non-metal materials, technology of surface protection, the system of quality and the technology of logistics. The structure of the enterprise is based on 3 main research Divisions: CBRN Protection, Special Electronics and Camouflage and Materials Engineering. In relation to its main goals the enterprise also develops research aimed at the protection of inhabitants against weapons of mass destruction, chemical, nuclear and radiation accidents, chemical, electronic and cybernetic terrorism and attacks on significant objects of state infrastructure. It is active in supporting technological, organisational and economic activities related to the armament of the Czech Army. And, besides other activities, it also conducts expertises and trials to ensure specialized preparation and training of the Czech Army, armed branches depending from the Ministry of Interior, foreign armies, etc. Among the current projects the VVU is running we can find interesting assets of modern warfare including research on countermeasures against the effects of unmanned anti-aircraft means, research of aging of ballistic protection materials, research on the detection and localization of UAVs used for illegal activities, and more. In 2015-2017 VVU worked on PANDUR L4 project with the goal to enhance the protection of the wheeled IFV of the Czech mechanized infantry to the STANAG level 4 (14.5x114 mm AP at 200 m, 155 mm HE at 30 m, 10 kg Blast AT Mine). Currently the enterprise is to provide, through subsuppliers, 65 sets of armoured windows and service to the window frames of the Light Armoured Vehicles IVECO in use by the light mechanized battalions of the Czech Army, as the life expectancy of the current ones expired.